Home » Kersten » What’s in a surname? As I started exploring backwards, I really only knew of two surnames. My father’s, Whitehead, and my mother’s maiden name Sublett. What you learn quickly is how these names grow exponentially as you research your family tree. The difficult thing to do for someone like me (can you say Adult ADHD) is to stay focused on a particular branch and not wonder off onto another branch before it’s time. I can attest to the many times I have been beckoned out of the office (or Vortex, as Cheryl calls it) and back to the present, that I refocus and ask myself, how did I get on this path. As we begin to explore backwards together, I am going to try to focus on my primary surnames. We will see how I do. I am very fortunate because my Aunt Leah had done an extensive amount of research on the Whitehead and Kersten side of the family. So, before we get further along, I want to know how thankful I am for her research. Margaret Agnes Kersten, my paternal grandmother, was born 13 March 1906 in Chicago, Illinois. Her parents, Peter Kersten and Anna Stalhaber had married 26 December 1903 in Chicago. According to the 1910 census, both Peter and Anna immigrated in 1893. But since they were not married at the time, I do not know if they had been engaged in Germany or just happen to meet. Aunt Leah? Aunt Viv? Dad? I would appreciate any of your recollections. Peter Kersten is listed as Single on the 1900 Census. He is was a boarder and renting a room from John Kalde and his family. His occupation was that of a Brewer. John Kalde is also listed a Brewer. So it is likely, they became friends while working together. The home is located on Cottage Grove Avenue. Here I discovered that the streets in the 1900’s do not reflect the current street map of Chicago. A more accurate understanding would be to review what enumeration district he was in. 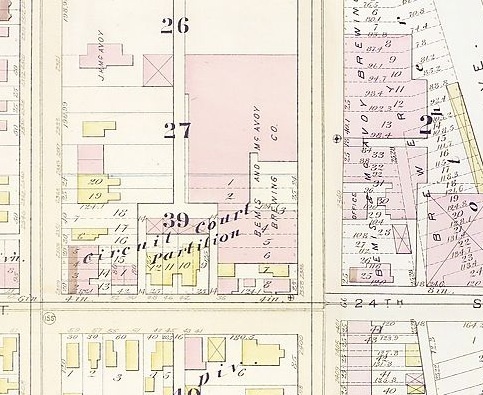 He was in ED 51, the boundaries of which were: E. 24th St., Lake Michigan, E. 26th St., and South Prairie Avenue. The reason I mention this is as we explore backwards we will see how much or how little the family moved. In 1910, Peter Kersten is now married to Anna Stalhaber. Margaret and William Kersten are listed on a census for the first time. Peter still works as a Brewer. This time, it is he who is renting out rooms. There are 3 boarders listed on this census. Peter’s family lives at 2804 S. Calumet Avenue. In 1920, Peter and Anna and the two kids are still renting their home. Peter’s brother John is living with them as well as a nephew, Harry Stalhaber. They are now living at 2411 South Park Avenue. Peter is still listed as a brewer. They have a couple of boarders listed here as well. According to his WWI, Draft Card, Peter Kersten worked as a Brewer for McAvoy Brewing Company. Okay, until later where we will explore backwards! This entry was posted in Kersten, Stalhaber, Whitehead and tagged Chicago, immigration, McAvoy Brewery, surnames. Bookmark the permalink.